Bilocation means being physically present in two places at the same time. The Real Presence of Jesus in the Blessed Sacrament is one form of this, although we do not see Him as He is in Heaven in the Host, yet we know that he is truly there, Body, Blood, Soul and Divinity. Saint Alphonsus Liguori, who was seen at the same in the pulpit preaching a sermon and in the confessional. Again, he was in Naples "preaching to university students when a poor woman called at Pagani to receive the alms usually given to her by the Saint. A lay brother, on answering the door, told her of the Saint's presence in another city and sent the poor woman away. Suddenly St. Alphonsus appeared and gave her the usual amount of money." Some of the other Saints are St. Paul of the Cross, St. Joseph of Cupertino, Saint Lydwina [Lydwine], Saint Martin de Porres, and Saint Catherine dei Ricci, and now, Saint Pio of Pietrelcina can be added to the array. In his book, Padre Pio, the Stigmatist, Fr. Charles M. Carty informs us that not only did Padre Pio have the grace of bilocation but also of vanishing and suspension in mid-air and even power over the elements. "Father, how will I manage to get down to the village without an umbrella? I'll be soaking wet!" "I'll go with you (in the spirit of course) ," answered Padre Pio. Todini wished him a good night, and left. Before opening the door to the square in front of the church, he could hear the rain cascading down the pavement. Although a powerful gust of wind surged towards him, he was taken by surprise to discover that it was barely sprinkling, just a few drops here and there, and no more. When he he reached the town, he went to his room at the place he was staying. "How wet you must be!" his hosts said to him as he entered. "Why, it was not raining at all!" "Not raining? Why it seemed like the end of the world!" "On the 8th of May, 1926, a dozen people from Bologna were waiting for Padre Pio in the hallway of the monastery of San Giovanni Rotondo. They had come from Monte Saint Angelo where they had been to visit the magnificent sanctuary with a hundred other pilgrims. Some of the group were already in the church praying. It is well to note that at this time there was no door leading directly from the sacristy to the monastery, therefore the Father had to pass through the church if he wanted to get into the sacristy. "The group waited in vain for a long time, wanting to be the first to speak to him. Another Father told them to their surprise that Padre Pio had been for some time in the church already, hearing confession. The visitors then realized that he could only have gotten there through supernatural means, because they had been waiting for him in the only hallway for over three hours. Fr. 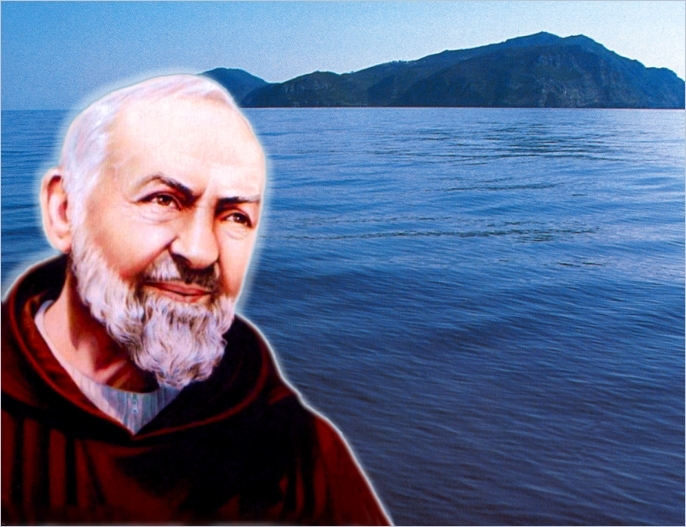 Carty further relates that at San Martino in Pensilis, a group of devotees of Padre Pio and members of the Third Order of Saint Francis, regularly met in the house of one or the other for their Franciscan reunion. Before beginning they would all say a little prayer to their Guardian Angels, asking them to go and call Padre Pio, so he could be present in their midst. Often, after having done so, they all smelled the fragrance associated with Padre Pio, and they all reverently knelt down saying: "Padre Pio is with us; he will direct our meeting."